160th Anniversary to the BPD’s Harbor Patrol Unit!!! Yesterday, Thursday, September 26, 2013, the Boston Police Department celebrated the 160th Anniversary of the Department’s Harbor Patrol Unit. In honor of their service and sacrifice, two hero signs were respectfully dedicated to Police Officer Joseph M. Mullen and Sgt. Robert P. Guiney at the Harbor Unit. In addition to the hero signs, both officers also have two new unit boats named after them. The Boston Police Department would like to thank all those who attended yesterday’s celebration. 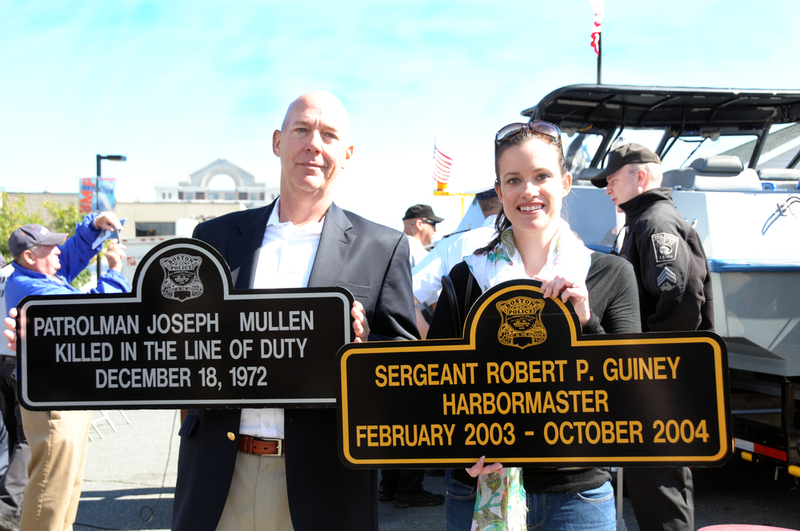 Police Officer Joseph M. Mullen, the longest serving officer of 35 years at the Harbor Unit, was killed in the line of duty on December 18, 1972. Active duty Sergeant Robert P. Guiney, the Harbormaster, lost his courageous battle to Cancer on October 16, 2004. The nation’s first Harbor Patrol was established in Boston in 1853. It became a unit that was the envy of all Departments. Many police departments in the United States contacted Boston to duplicate their techniques for their own Harbor Patrols. Division Eight was established to cover the harbor and islands after Marshal Tukey suggested the need for a water patrol to protect the anchored ships and wharves from depredations. Such attacks between 1852 and 1853, some involving the use of chloroform on the ships’ crews, helped to convince the city council to act. In June of 1853, ten men and a captain were commissioned as harbor police, the first in the United States. During their first week on the job, they captured a ring of river pirates. They went on to prove their effectiveness by rescuing persons from drowning, retrieving lost boats and assuming the grim task of recovering bodies from the harbor. They also helped to explain harbor regulations to incoming vessels. Some of the new regulations were established by our own Harbor Unit, and are still in use today. The Boston Harbor Police were easily accepted into the merchant community. Today’s Boston Police Harbor Patrol Unit has the best equipment and training in the United States. The Dive Team is responsible for recovering evidence used in the prosecution of major crimes. Our Recovery Team has saved many from capsized boats and strandings in the Harbor. They possess two Interceptors boats and a fleet of eight more ships. Today’s Harbor Patrol Harbormaster is Sergeant Joseph Cheevers, with all officers assigned to the Harbor Patrol Unit serving as Assistant Harbor Masters. Reference to this information: Establishment of harbor division in City Records, XXXI, June 1853 Tukey suggestion in Annual Police Report (1851) P.14 Pirates in Annual Police Report (1854), Page 7, and ibid. (1871) Page 69; routine work ibid, (1861) page 7-8.